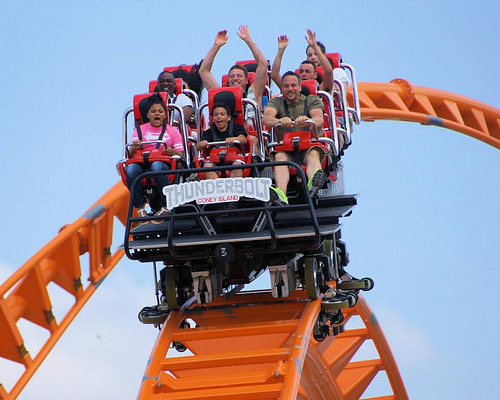 ATZ wrote about the Thunderbolt when it broke ground (“High Hopes for Coney Island’s New Thunderbolt Coaster,” March 10, 2014) and as it took shape (“New Thunderbolt Loops the Loop Again in Coney Island,” May 19, 2014). Yet it’s still an astonishment to come upon its steel loops and dips from Surf Avenue. The coaster has the allure of an abstract sculpture and occupies part of a long vacant block where the Drop the Dip, Thunderbolt, and Wild Mouse coasters once thrilled and the Magic Carpet Fun House and Donkey Ball Game amused the millions. On Friday, a New York Times reporter’s 9-year-old daughter starred in the best-ever vid of a coaster’s test run. 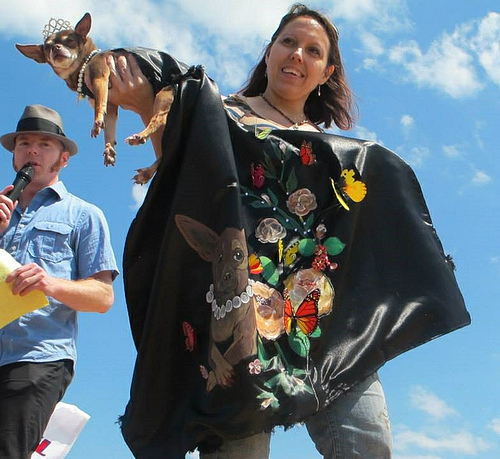 Chai Latte, a 3-year-old chihuahua from Queens won 1st prize in Saturday’s Pet Costume Contest at Deno’s. And the Cyclones opened their season with an 8-2 victory over the Staten Island Yankees in front of an above-capacity crowd of 8,175. This is wonderful — I feel united with eras of New York past that looked to Coney Island to start their summer.